Why Won't the Ceiling Fan Turn On With a Wall Switch? Installing an electric ceiling fan provides a cost-effective means of generating cool air during the summer months. Wiring the device to a light switch makes operating the fan as easy as turning on a light in the room. Problems with home wiring lead to problems with the fan's power, especially in an older home. A ceiling fan's control box must connect with a room's wiring to operate. The outlet wiring in the room with the ceiling fan might be inadequate. If the outlet wiring in a given room only has two connections, a black and a white wire, you can't hook the fan into these outlets unless you purchase a control box specifically designed for your fan model. Paying an electrician to rewire a room to support the ceiling fan without purchasing a specific control box is expensive. Outlets wired with three separate connections can accommodate a ceiling fan, but you will still need to purchase a control box to wire the fan into the wall outlet. The difference is that you don't need a control box specific to the ceiling fan brand. 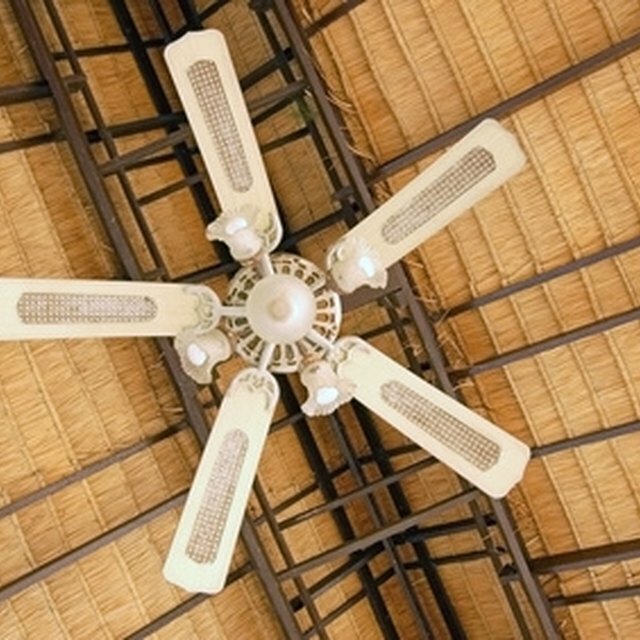 An improperly installed ceiling fan can vibrate more than normal during operation. This problem can cause connections in the unit's junction box to loosen, which impedes the flow of electricity to the ceiling fan. Remove the fan and inspect the junction box mounted just above where the fan sits in the ceiling. Tighten the loose nuts connecting the box's wiring. Shut off all power leading to the junction box prior to inspecting and repairing the unit. Failing to do so can result in significant injury from electrocution. A wall outlet or light switch can only accommodate so many devices drawing power from it at any one time. If you overload the wall outlet or switch by adding appliances attached to surge protectors, light fixtures and extension cords, you risk causing a short in the wiring. This short could be the reason your ceiling fan won't run if it also attaches to this outlet. Overloading a wall outlet presents a significant fire hazard for your home. The short in the outlet's wiring can cause an electrical fire inside your walls, leading to a major fire. If the wiring in your home is old, frayed electrical connections within your outlets can inhibit the function of appliances and light fixtures. Before you inspect the entire wiring grid in a room, examine the wiring connections of your ceiling fan to ensure all the wires attach properly. If the connections are intact, inspect the wiring from the outlet. Hire a licensed electrical inspector to locate the bad wiring connection in a room of your home that's causing the problem.